A Life of Sugar and Spice: What's cookin, good lookin? 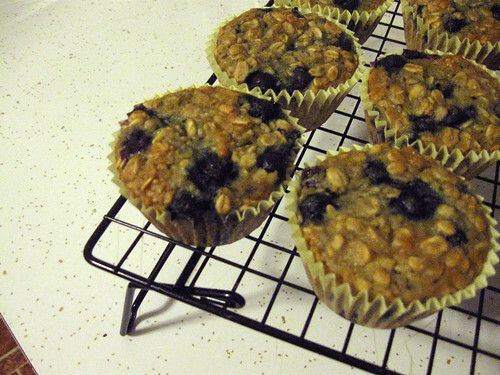 Here's another Pinterest find - Insanely Good Oatmeal Blueberry Muffins. I followed the recipe almost exactly, using Bob's Red Mill GF Oats, Better Batter for the flour, frozen blueberries and honey instead of agave. My only fault was that I didn't put the oats in the food processor first. I mean, I meant to do that. Yeah, I wanted chunky oat filled muffins! No I didn't really, I just didn't read the instructions CAREFULLY before a began and I had the oats soaking in the milk before I realized I was supposed to process them first. Oh well. These came out pretty good, nothing mind blowing by any means. This brings me to another topic of discussion. A lot of foodies out there are trying to make "healthier" baked goods. This recipe is certainly one of them. People are reducing the fat by taking out butter and adding apple sauce, using less sugar, replacing refined sugar with "natural" sweeteners... and so on and so forth. However, lately I've started to see a shift in that people are now saying if you are going to bake muffins, bake traditional muffins! That's what you're craving, and the "healthier" version is probably not going to satisfy you. Not only that, but is the proclaimed "healthier" version actually that much better for you? What I've found is that most of these recipes are still loaded with sugar, just in various forms. Removing the butter and adding applesauce is a big one, you are replacing fat with sugar. Yes maybe that sugar has trace amounts of vitamins and minerals from it's original form, but is it enough to count? I'd argue that butter in it's most natural form is better than processed sugar any day. Are there truly healthy snack options out there? I'm sure there are. Do they compare to the real deal? Most often, no. I think the bottom line is that we just shouldn't be eating the sweet stuff that often, and when we do, go big or go home, I say. This blog has always talked a lot about sugar, I eat way too much of it and I have done more than enough research to know that it's bad stuff, no matter what form it comes in (honey, agave, raw sugar.... etc). I'd love to hear what YOU think about it. Share with me your healthier yet still tasty treats! I tend to lean toward whatever is less processed. I stay away from the refined white powders, be it cane sugar or stevia. Usually I use local raw honey, or if I am baking, less local honey. It has health properties that seem to be working for me so far, and is the least processed thing out there, so far as I know. I think that the more you "tinker" with nature, the more you change your foods, and the less good it does your body. But I still like cookies. And chocolate. You have to fail to succeed?